Many of the people who come to this blog from search engines are interested in finding a list of the top Google searches for this year. The problem is, they find the list of top Google Mobile Searches for 2011, which I found by using the same technique in the Google Keyword Tool that I used to get the top YouTube searches. 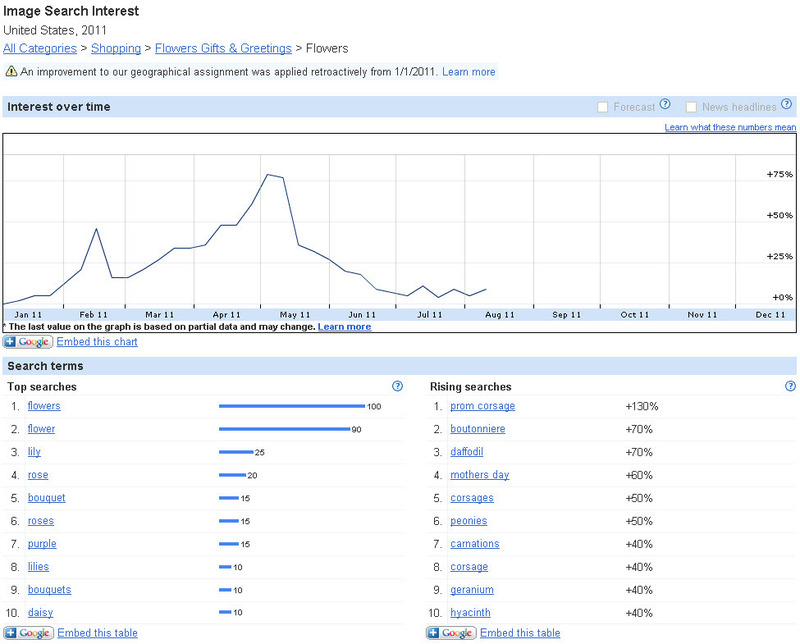 An easier way to find the top Google searches, however, is to use Google Insights for Search. You can use it to find the top Google searches in a given year, or in the past 7 days. To find these, simply go to Google Insights for Search, enter the country and search type you�re interested in seeing popular terms for and the time you�re interested in seeing, leave the search terms field blank and hit Search. 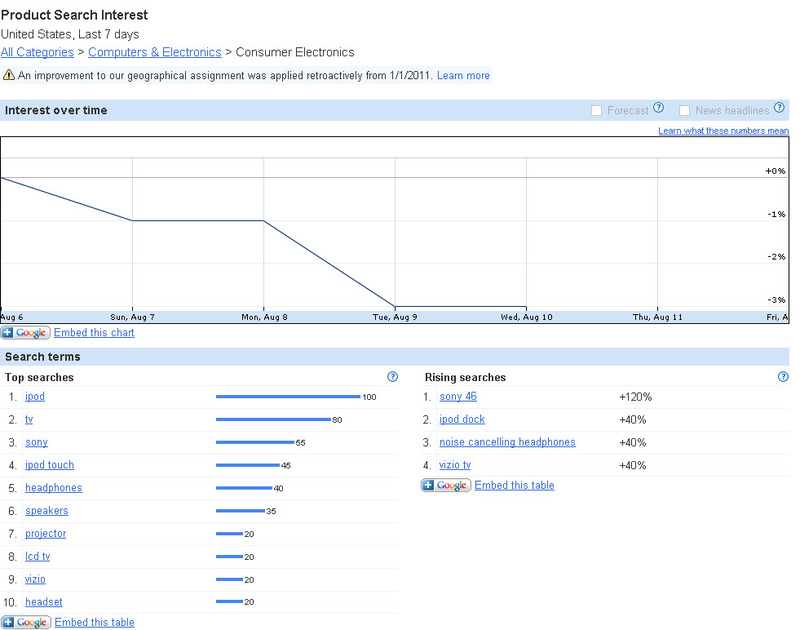 The interface (above) will show you top ten searches and top ten rising searches for the time period you�ve specified. However, if you download the CSV, the export will display the top 50 searches. Unfortunately mobile searches aren�t specified, so I had to use a more indirect method to find these. However, if you�re just looking for top Google searches for 2011 (or any year), as many visitors to this site are, you can use the method above to find them easily. There are many applications for this technique. For example, if you�re Amazon or a large e-commerce site that wants to see what people are buying this week in the Consumer Electronics category, simply select Product Searches as the search type, drill down to the Consumer Electronics category, select 7 days as the time filter and location United States, and Google will give you the top searches this week in that category in Product Search. Or if you�re a large flower retailer or some other business whose target search results are affected by image search, you can use the tool to find the top image searches in the Flowers category for 2011. 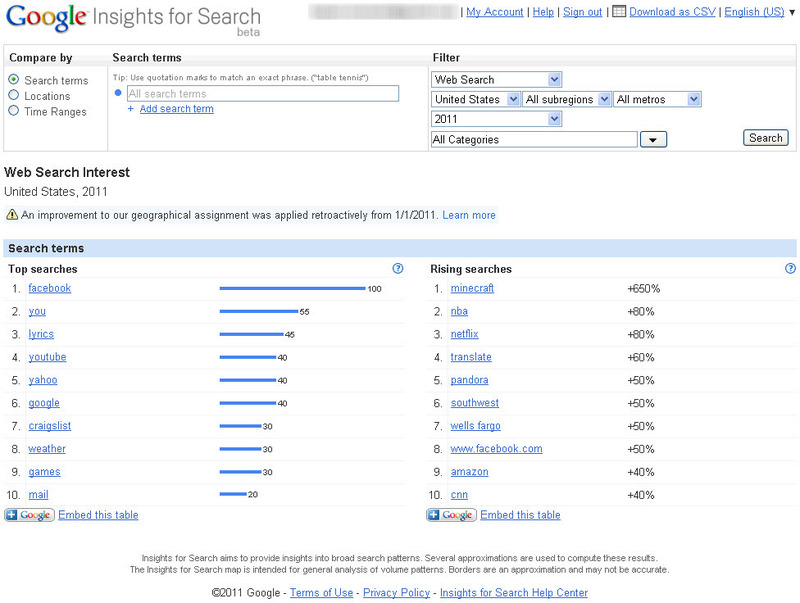 If you�re looking for the top Google searches for 2011, look no further than Google Insights for Search. Just be sure to leave the search terms field blank, and use what you find to make relevant content easier to find.